Only a calm mind and an effort patient to itself is able to create an extensive knowledge. I recommend myself in the memory of the noble and eminent young Ferenc Pápai Páriz, born from noble parents for the hope of the fatherland, who sets out for visiting foreign academies; and I wish him fortunate success. In Kolozsvár, on August 12, 1711. Sámuel Szatmárnémethi was born on August 10, 1658 in Szatmárnémeti (Satu Mare). His elder brother was the Reformed dean Mihály (1638-1689). He learned first in his native town, then from 1675 in the College of Kolozsvár, and from 1679 in Debrecen. In 1680 he went to Utrecht and Leiden, and from there in 1682 to Franeker. From the autumn of 1683 he taught Biblical languages and philosophy in Kolozsvár. From 1693 he was the tutor of Prince Mihály II. Apafi of Transylvania, and in the autumn of 1695 he became professor of theology in the College of Kolozsvár. He died on December 17, 1717 in Kolozsvár. He left his library to the college together with an important donation, and he also left significant funds for the Reformed Colleges of Gyulafehérvár (Alba Iulia), Nagyenyed (Aiud) and Marosvásárhely (Târgu Mureş). He was an authoritative Reformed theologian of his period, a leading Hungarian representative of the Cartesian Cocceian school, a fertile author of theological works. The foreword to a book of his published in Utrecht in 1714 was written by Herman Alexander Röell, then professor of the University of Utrecht. It is a painful fact that he was one of those that caused with his arrogance and envy the financial and intellectual collapse of the internationally renowned printer Miklós Misztótfalusi Kis, who had returned home in 1690 from Amsterdam. He published several laudatory poems, funeral sermons, biblical commentaries, amongst other: Disputatio theologica … causam Sp. S. Vitricem demonstrans … sub praesidio … Christophori Wittichii … Leiden, 1681. – Exercitii philosophico-metaphysici de perenni duratione mentis … Leiden, 1682. – Moses explicatus, id est ceremoniarum Veteris Testamenti per Mosen latarum detecta veritas, Kolozsvár 1696. – Regnum Dei in extremo dierum imprimis exhibitum ad scripturae normam effigiatum. Franeker, 1683. – Epistola S. Pauli ad Hebraeos explicata. Franeker, 1695, 1701, 1702. – Prophetia sancti prophetae Zachariae explicata … [Praefationem scripsit] Herm. Alexander Röell. Utrecht, 1714. – Metaphysica contracta. Kolozsvár, 1696. – Dissertatio metaphysica de perenni duratione mentis. Kolozsvár, 1696. 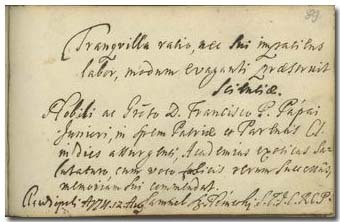 Professor Sámuel Szatmárnémethi made his note in the Album in Kolozsvár in 1711. His name is followed by a curious abbreviation: S.T.I.C.R.C.P. – Sanctae Theologiae in Coll. Reform. Claudiopolitanorum Professor, that is, Professor of Divinity in the Reformed College of Kolozsvár. Three decades earlier he himself had visited those universities in the Netherlands where now the young Ferenc Páriz Pápai was going to go. His former student, Prince Mihály II. Apafi noted in the Album in 1711 (p. 35), while Röell in 1714 (p. 111).